Specialist moving and handling training and consultancy services. 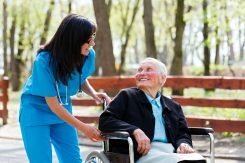 OFI frequently work with care homes & hospitals, within the NHS network and in the Private Care sector. Osteopaths For Industry is a leading UK provider of specialist moving and handling of people training courses, suitable for carers and health and social care. Moving and Handling of people is a complex area with a very high risk of injury. Training requires a specialist approach & clinical expertise in order to be truly effective. OFI provides Moving and Handling Training, and related consultancy services, to a wide variety of organisations including hospitals, therapy centres, residential, day centres, local authorities, home care and school facilities. Our on-site Moving and Handling courses are all customised to your specific working environment and activities. Our Moving and Handling Instructor courses enable your organisation to train highly qualified People Handling Instructors, who will be able to carry out your training in house. We train hundreds of Moving & Handling Instructors every year. Cost-effective and accessible moving & handling training. Because our training modules are tailored and filmed at your site, our online solutions are specific to your individual working environment. Why not bring in of our experts in to carry out on-site Moving & Handling Risk Assessments? Alternatively, book your own Risk Assessors on one of our Moving & Handling Risk Assessor Courses and we will train, asses and certify them. What is People Moving and Handling? 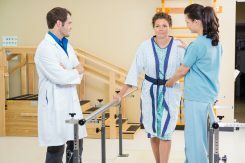 Suitable Moving and Handling training is likely to reduce the likelihood of manual handling injuries occurring, reduce the frequency that they occur, and reduce their severity. Who is People Moving and Handling training for? “Manual Handling” is defined as the transporting or supporting of a load or person (including lifting, putting down, pushing, pulling, carrying or moving) by hand or by bodily force. So by this definition, Moving & Handling Training is intended for any person that undertakes such duties as part of their work. What are the benefits of Moving and Handling training with OFI? OFI has some of the very best and most experienced trainers in the business. Our unique selling point is that ALL of our trainers are qualified (and experienced) Osteopaths or Physiotherapists. This provides them with an intricate understanding of the human body and its musculoskeletal systems. We provide specialist Moving and Handling training in areas that are often considered more challenging, and where a customised training solution is required due to the specific nature of the moving and handling activities. For example, the handling of children or people with cognitive and physical disabilities. Our in-house courses can be customised to meet your specific requirements – we don’t believe in “one-size fits-all” training courses! In addition, you will have priority access to our specialist trainers for advice on any Moving and Handling issues that may arise following your training course, and your organisation will have access to our free online training tutorials and videos. Moving and Handling Training is a demanding area of Health and Safety, requiring medical and clinical knowledge as well as practical application. Our specialist knowledge of Musculoskeletal Disorders distinguishes us from ‘generalist’ Health and Safety providers, and all of our Instructors are experienced Osteopaths or Physiotherapists with experience in all sectors of industry. Years of professional training and clinical experience makes our Instructor team ideally placed to deliver effective moving and handling practical skills training. Our team’s professional background enables them to explain the ‘Why behind the How’ of using good handling technique which increases the effectiveness of training. Osteopaths For Industry are trusted by some of the top organisations in the UK to provide effective People Moving and Handling Training and Risk Management advice.